Fill up a large saucepan half-way with cold water and gently add the eggs, making sure the eggs are covered with at least an inch of water. Add a teaspoon of vinegar to the water ( will help contain egg whites from leaking out if any of the shells crack while cooking) and a pinch of salt. Bring the water to a boil. Once it reaches a boil, cover the pot and remove from heat. Let sit covered for 12-15 minutes. Drain hot water from pan and run cold water over the eggs. Allow the eggs to sit in the cool water a few minutes, changing if necessary to keep it cool. Gently crack and peel the eggs (placing the eggs underneath running water helps with this). Slice each peeled egg in half, lengthwise. Gently remove the yolk halves and place into a small mixing bowl. 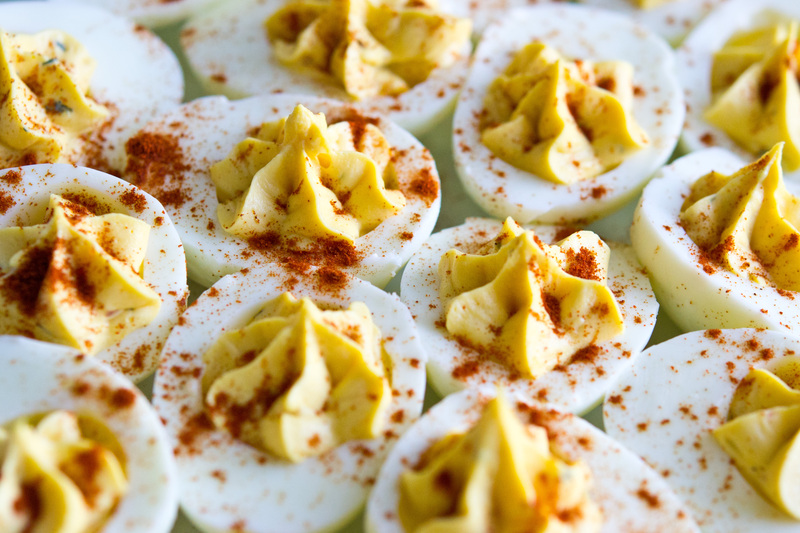 Arrange the egg white halves on a serving platter. Mash up the yolks with the remaining ingredients (adding or supplementing other ingredients if preferred, such as wasabi or curry powder). Spoon egg yolk mixture into the egg white halves. Sprinkle with paprika.